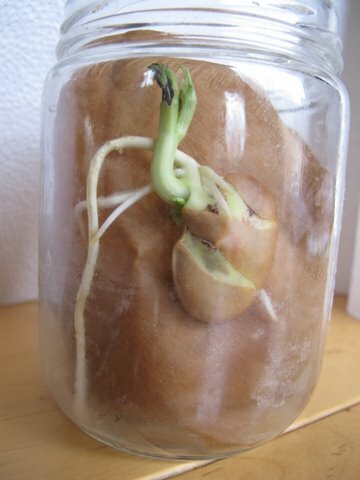 Bean seed are planted at different angles, to test which way the roots and shoots grow. Done as a demonstration. What might affect the direction that roots grow? Make a ring of coffee filters paper towels inside the jar, and stuff the centre with more paper towels. Add water to the paper towels until they are wet and there is a small puddle at the bottom of the jar. 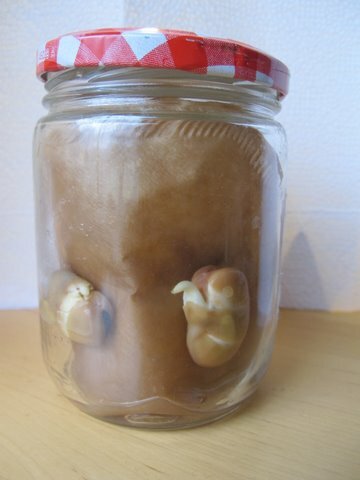 Push the bean seeds between the coffee filter ring and the glass jar wall, to hold them in place, each at a different angle, spread out around the jar. What can we conclude about something other than water and air (and darkness) that seed germination is sensitive to? Gravity. The roots always grow downwards, then the shoot upwards. The seeds are uniformly wet and exposed to light, so they use gravity to determine which way to grow. Apparently, this can be set up with a pin through the bean. The lid can be rested on to keep water evaporation to a minimum, while allowing air to get into the jar. This is a good activity to show the results of after other germination factors have been determined.